The first week of July is in the books and the Phillies are proving time and time again that they are legitimate contenders in the NL East and will be playing meaningful baseball in September. Like I said before the season started – there would be a chance for the Phillies to be buyers at the deadline. This is it. This is what we’ve been waiting for. 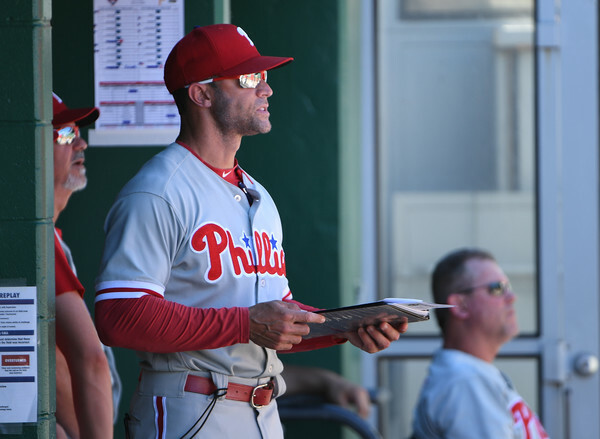 While the Phillies aren’t exactly the top team in the league, they certainly are in a position to make things interesting. There are a variety of routes they could go: they could pursue a starting pitcher like Cole Hamels, they could go after a relief pitcher, they could try to go after Manny Machado. Here I would like to pursue a different route – I suggest the Phillies kick the tires on Nolan Arenado. Nolan Arenado, the All-Star third baseman from the Colorado Rockies could find his way out of the mile-high city sooner or later. Earlier this month Arenado was on the record saying that he is “tired of coming to the ballpark and losing.” The Rockies are hovering around .500 and beings they are mired in mediocrity they could deal their franchise corner stone to begin a rebuild a la the 2013 Sixers. Conveniently for Arenado, the Phillies are a young team on a major upswing. They are fighting for first place in the NL East, they have a 25-year old pitcher who is a legitimate Cy Young candidate, they have young bats in place who are proving to be big league contributors and a couple relivers who can shutdown opposing lineups. What’s not to like about the Phillies situation if you’re Nolan Arenado? For the Phillies, they would be on the receiving end of a massive upgrade at the hot corner. He’s a five-time Gold Glove winner, four time All-Star, career .292 hitter all by the age of 27. He won’t become a free agent until 2020 which means he will have one year of team control in addition to the two-three months he will be in town this year. The biggest downside to Arenado is that he won’t come cheap. The first piece involved in a trade for Arenado would be the incumbent third baseman Maikel Franco. I have no problem including him in this trade. The next piece would have to be two top level hitting prospects like Mickey Moniak, Cornelius Randolph or Adam Haseley. Another name to keep an eye on would be Dylan Cozens – a power hitter in that stadium could be a match made in heaven. Not to mention pitching prospects like Sixto Sanchez, Adonis Medina or Enyel De Los Santos. The Phillies could throw in other prospects as sweeteners – guys like Roman Quinn, Tom Eshelman or Jose Gomez (who was acquired by the Phillies at the trade deadline last year from the Rockies). It could take some young MLB talent to land a player like Arenado as well – be prepared to see the Phillies put a player like Nick Williams or J.P. Crawford out there as well. At the end of the day, I would put some serious thought into acquiring Arenado at the trade deadline. The Phillies are in a good position and could intrigue someone like Arenado who is trying to find a winning atmosphere. He is a better fit than Machado because he has another year of eligibility before becoming a free agent. So long as the asking price isn’t too high, I would pull the trigger on upgrading the hot corner with Arenado.